Michele Anders (center) and Deirdre Power, Kaiser Permanente nurses, make picket signs at the California Nurses Association headquarters in Oakland in preparation for Thursday’s planned strike. As many as 23,000 registered nurses are expected to walk off their jobs Thursday at Kaiser Permanente, Children’s Hospital Oakland and many Sutter Health medical centers in Northern and Central California. The Kaiser strike – which will involve about 17,000 nurses represented by the California Nurses Association-National Nurses United – is in sympathy with 1,500 mental health and optometry employees at Kaiser facilities in Northern California represented by the National Union of Healthcare Workers. Mental health workers at Kaiser said they’re striking over proposed cuts to their health and retirement benefits, and what they described as exceptionally long wait times for patients to receive individual psychiatric care. They are also expected to be joined by another 2,000 equipment engineers from another union. Registered nurses at Children’s Hospital Oakland and Sutter Health centers are also holding a one-day walkout Thursday, but the strike is over their ongoing contract disputes at those facilities. In total, 34 hospitals in Northern and Central California will be affected by Thursday’s labor action. Officials from the hospitals affected by the strikes said they will continue to provide care by hiring replacement workers and rescheduling elective procedures. 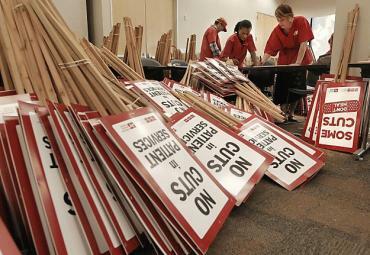 via Nurses to strike California hospitals Thursday. The strike is justified. Kaiser promises members mental health services that they cannot begin to deliver because of the shortage of workers. I’ve been with Kaiser for a dozen years, both through employers and as an individual member. However, I am seriously considering changing to a new medical provider this fall, largely because of this deception. Keeping medical costs contained is one thing. Short-staffing so that members are treated like cattle instead of patients and the organization can’t deliver the care THEY contracted to deliver at the cost THEY set, is something else altogether.